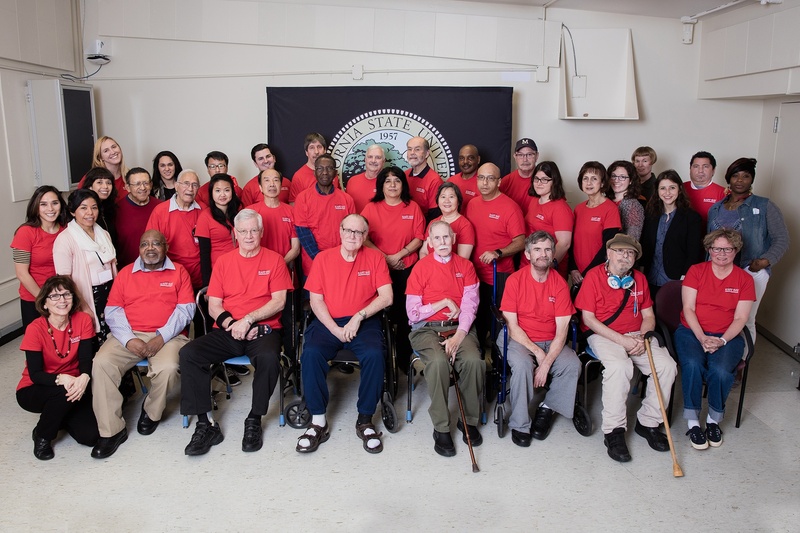 The Aphasia Treatment Program (ATP), housed within the Department of Communicative Sciences and Disorders at Cal State East Bay, was established in 1996 by professor emeriti, Dr. Jan Avent. She was an early pioneer in creating an intensive aphasia program that trained graduate students how to implement a variety of diagnostic measures and group treatments for aphasia. She also adapted a cooperative learning methodology to aphasia treatment by having two clients work as partners to deliver treatment with the guidance of a graduate clinician. This therapy, known as Cooperative Therapy (Avent, 1997), continues to be an integral part of the program. Twenty years later, ATP remains dedicated to implementing innovative program development to promote the life participation model and aphasia advocacy, providing excellence in training and clinical service provision, furthering research in aphasia care, and building community partnerships. With a nod to the school mascot, the Cal State East Bay Pioneers, they like to say they have been pioneering communicative access from campus to community from 1996-2017. ATP meets from 10:30 a.m. to 3:30 p.m. twice weekly during the school year. Currently, there are about 30 members in the main, full-day program. ATP starts the day with 30 minutes of large group reading and writing practice where members set individual goals while working on a thematic packet created by the graduate clinicians. 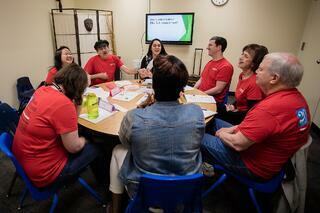 Next, ATP members divide into four, hour-long conversation-focused groups which highlight communicative strategies through peer modeling and feedback to maximize communicative success, engage adults with aphasia in new learning using adult learning principles, and promote psychosocial support and a sense of community among members. members. On Mondays, ATP offers three Book Clubs and a News Group. On Wednesdays, ATP runs News Group and Aphasia TonesTM Choir, a National Stroke Association Raise Award winner and a life participation singing group that employs communication ramps such as enhanced visuals for the music and verbal instruction and amplified gestural support by the graduate clinician choir directors. The choir members take great pride in performing at campus and community events where they are able to raise awareness of aphasia through their concerts. They will be performing at ATP’s 8th annual concert to honor June as National Aphasia Awareness Month. In an additional effort to raise awareness of aphasia with the public at large, the ATP has partnered with the National Park Service (NPS) at Yosemite and the Golden Gate National Recreation Area to improve communicative access at parks via ranger training and the development of aphasia-friendly park brochures. This ongoing collaboration has been recognized with multiple honors, including a 2015 Distinguished Service award from ASHA and a 2014 Public Service Award from the California Speech, Language and Hearing Association (CSHA). The ATP at Cal State East Bay has had a year-long celebration of its 20th Anniversary. It started with being awarded the 2017 Program of the Year by the California Speech, Language and Hearing Association and culminated in a large gala on May 6th. The festive 20th anniversary gala luncheon was attended by over 200 ATP members and their families, alumni, community members, and current students. All attendees received an aphasia communication tips bookmark designed by graduate clinician, Kemi Siobal, who used the ideas generated by ATP caregivers at an earlier family education event. Lingraphica proudly supported the gala and the service that the ATP has provided to the aphasia community for the last two decades. In recognition of this milestone, ATP founder Dr. Avent reached out to former ATP clinicians and asked them to submit a six-word story entitled “What does ATP mean to me.” She compiled almost 50 stories spanning the entire 20-year ATP history into a book for ATP members. Best wishes for another 20 years, ATP! For further information about ATP, visit: www.csueastbay.edu/atp or contact Ellen Bernstein-Ellis, Director, Aphasia Treatment Program at Ellen.Bernstein-Ellis@csueastbay.edu.